This is the third post in a series on getting organized for Project Life. 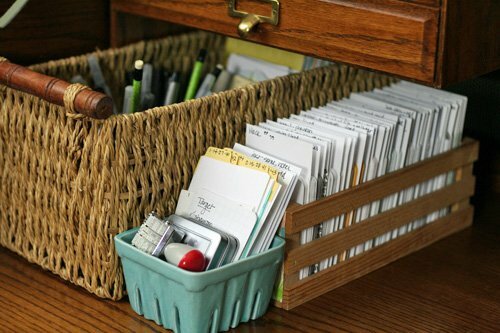 Go here to read the Getting Organized for Project Life – Part 1 and go here to read Getting Organized for Project Life – Part 2. Project Life is a memory keeping system developed by Becky Higgins. I’m using Project Life to document 2013, week by week, as part of my 13 Goals in 2013 Challenge. Now that you’re up to date…let’s pick up where I left off. In this post I’ll share how I organize and store my Project Life supplies, as well as my process — so far — for putting pages together. Problem #3: I need a way to store my Project Life tools and supplies in my family room, and set up a little work area for assembling pages. Organizing Solutions #3: Use minimal tools and supplies—to keep the process simple and ensure everything fits in my family room. 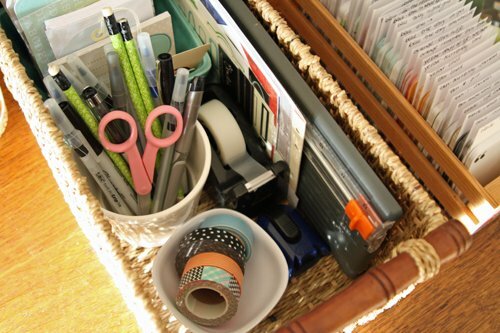 In the wicker basket I store these essentials: paper trimmer, glue stick, 4 x 6 cards (from the Sea Foam Core Kit and Turquoise Core Kit), pens, markers, scissors, note cards, corner rounder, washi tape, a collapsible mesh trash can, and a few blank labels. So far, the only other supplies I want to add are a bit more washi tape, some more plain labels and a marker for writing on photos. All of this will easily fit in the basket. 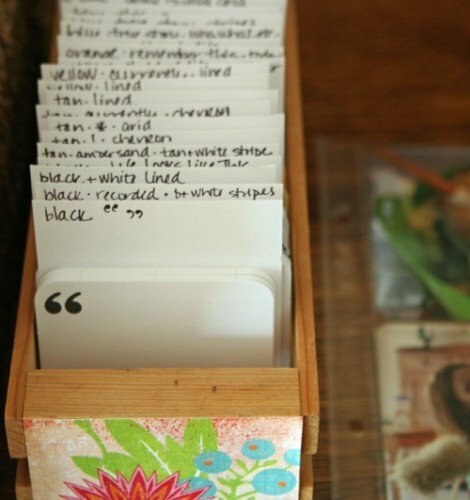 I store my 3×4 journaling cards in a small wooden crate. I organized my cards first by color, and then by card type. I made simple dividers with 3×5 cards. I love this because it’s super easy to get my fingers on the card I want when it comes time to assemble pages. The only other products I use and store nearby are extra sheet protectors, which are stored in a desk drawer, and I keep my in-process binder (finished pages) on a nearby bookcase. While limiting my supplies was out of necessity (space limitations) it has led to surprising benefits. It is making me love this project even more! The whole process of assembling pages is easier and more fun for me because I have fewer choices to make. Here’s how I do it. 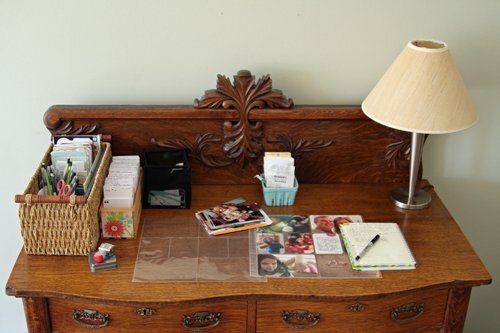 I move my two little product containers (the basket and crate), empty sheet protectors and my package of photos to the buffet that is just a few steps away from my roll top desk. It is the perfect standing height for me. So when I’m ready to put my pages together, I stand at the buffet and tuck photos into the pockets first. Then, I see how much space I have left for journaling cards and memorabilia. I fill out journaling cards, using the notes in my journal and my little weekly card filing system. I just pull out the highlights – whatever will fit in the space I have. Assembling pages is my favorite part of the process. It’s amazing how much things can change in just a few weeks…and how other things stay exactly the same. So far, this is all working great. And by keeping it simple, I have even started going back and printing photos from 2012, so I can put together a 2012 project life, too. I know there will be holes…places where I stopped documenting and taking photos. But that’s okay…that’s what life looked like in 2012. So there you have it. My super simple, giving-myself-permission-to-be-a-beginner, Project Life organizing systems and process! I’d love to hear your thoughts. If you’re a Project Lifer, what works for you? What doesn’t currently work for you? Thanks for sharing! I LOVE the way you organized your cards! I sorta did that within the box, but your little crate has me SO INSPIRED. What’s working for me now, is that I moved a card table into our bedroom so I can layout my PL album. I was storing it in a built in closet and everytime I would work on it I’d have to pull it out and put it on the floor or the bed, as I didn’t have enough workspace to make it lay flat. This has really increased my productivity. Even though I have a dedicated space downstairs, my computer and family are upstairs. So I’ve created a little project life station and it makes me so happy. I feel like I have everything in place to make 2013 even easier. Right now I’m just experimenting with different containers I already have to store the limited supplies I use for PL. I agree that limiting your supplies really helps. I love that little blue ceramic basket! Thanks, Alyssa! It sounds like you are really close to having your satellite space for Project Life all set up. That little crate is soooo old. It was from a little window sill herb garden I got 100 years ago. I was so excited to be able to re-purpose it. The ceramic basket is from anthropologie. I didn’t show it, but there is a larger one in the bigger basket. Let us know what you decide to store your stuff in. Thanks, Cara! I really appreciate your comments. As I was putting this together I was wondering if my approach was soooo simple that it wasn’t relevant / worth sharing, LOL. Glad you found some ideas that were helpful to you. By the way, I am obsessed with your desk! Thanks for your comment Sam! That desk is an antique hutch that my husband brought with him into our marriage. Lucky catch, right? Thanks for the great tips on organizing PL supplies. I’ve adopted the idea of keeping a basket of PL supplies in my family room. I was wondering where you found the pop-up trash bin. I recycle all of my scraps of paper that aren’t big enough to keep. I’d love to have a bin that collapses to keep in my PL basket. My pop-up trash bin was made by Making Memories…unfortunately it is no longer made. The container store has something similar. Thank you for stating permission to go back in time, and for leaving blanks! I have found that with much older kids (two off in college, how did that happen?? ), I take FAR fewer photos now. Being a tad OCD about things, the thought of having blanks made me twitchy, and wary of doing Project Life. But really, isn’t that what my life is now? So that is what my PL should look like! So THANK YOU!! Thanks so much for your comment. It’s nice to see you! I’m really glad that idea connected with you. I hope you enjoy Project Life – blanks and all – as much as I do. Aby, I was wondering if you could update on how your PL is going. I love your simplified plan. I want to make this work. I did about 6 weeks of PL digital version, but am finding that I really want to play with the paper cards and photos. I’ve been a digital scrapper for so long but really want to be able to do both traditional and digital to meet those creative needs I have. What do you do when you don’t have a pic for the day? Just fill in with a quote card or something? I’m going to have a lot of blanks if I’m going to pick up where I left off but I really want this for us. My twins were born (2 girls and on my bday!) and I’m planning to sign up as an alumni to the time class I never finished last year. Very excited. Aby, you already have a good system but I found this and thought it might be helpful for someone else that is struggling to pull this together (and for me!). I love your system. Just a question. do you seperate the back and front or do you keep them together and put whats on it on the cards. Asking this because from some I only have 5 cards if I split them up in back and front design. Thanks for your question! I keep all the cards facing the same direction. But I note on the divider card what is on each side. I put my favorite side facing the front.